The rise of the #MeToo movement has thrown back the curtain on gender-based violence with a focus on sexual harassment and coercion at work, resulting in a global call for safer workplaces. The movement reveals a hidden truth: gender-based violence happens everywhere. For many this seems obvious, but what about a market development expert? An agricultural extensionist? A nutrition curriculum designer? Sahar Alnouri, EnCompass’ team leader for the Feed the Future Advancing Women’s Empowerment (AWE) program, sat down with Krista Jacobs and Jenn Williamson to talk about survivor-centered approaches to addressing gender-based violence in the agriculture sector and how AWE can help. Krista is Senior Gender Advisor in USAID’s Bureau for Food Security, which leads the U.S. Government's Feed the Future initiative, and Jenn is Senior Director of Gender and Social Inclusion at ACDI/VOCA—key partners for the AWE program. EnCompass Insights has captured some of the main threads from that conversation here, as part of our series on this year’s 16 Days of Activism against Gender-Based Violence, which focuses on the world of work. The group began with a discussion of why it’s so important to address gender-based violence in the agriculture sector. Krista: As a gender advisor in agriculture, I see a big part of my role as reminding people to think about the people in our projects, to ask questions about the connections. It puts us in a good space to begin this conversation. Jenn: We know gender-based violence affects women’s ability to participate in agriculture—to move freely, to access markets, to negotiate deals. It affects their incomes and the stability of their homes. It is a women’s rights issue, a human rights issue, and relevant from the productivity perspective. Krista: Right. The World Bank estimates gender-based violence could be costing up to four percent of GDP. In some countries where we work, 40 percent of GDP is from agriculture. 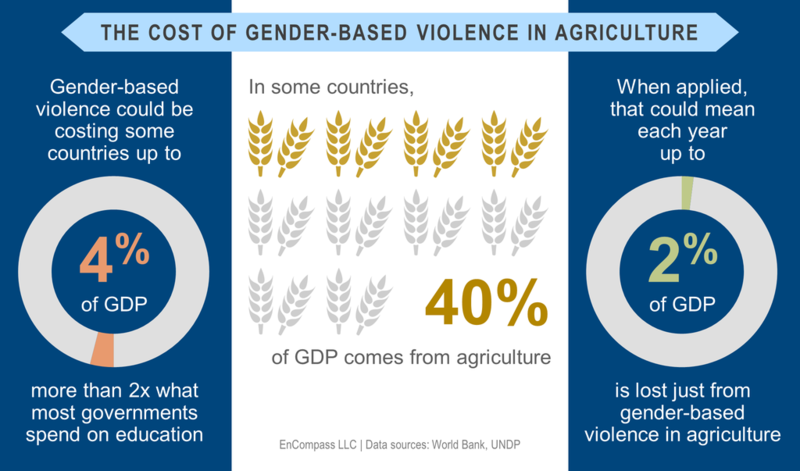 If we do a really loose application of those percentages, that could be 1-2 percent of GDP lost just from gender-based violence in agriculture. Sahar: And think about some of the other statistics, like that depending on the country, women supply 30–80 percent of agricultural labor. If you take that, along with the United Nations estimate that about one in three women experience gender-based violence, you see that women are a very big part of the agriculture sector and that gender-based violence is a part of women’s daily existence. The cost is monumental. The group agreed that a major hurdle is the continuing expectation that the problem belongs in the hands of gender experts and gender-based violence specialists. In fact, preventing and reducing gender-based violence in agriculture is impossible without the engagement of diverse partners from multiple sectors. Sahar: I think one reason people don’t engage is out of fear—being afraid of doing harm or making it worse somehow. That comes from a lack of capacity. We have a responsibility to make language and responses more accessible and demystify resources like GBV referral pathways. You shouldn’t have to be a gender specialist to put some basic preventative measures in place. One of our calls to action for the AWE program is to help identify and create contextualized and survivor-centered tools and training for agricultural teams. They all agreed: programming should be survivor-led and survivor-centric, and agriculture specialists must see themselves as essential partners in prevention and response, working with survivors and gender specialists toward safer programs. Importantly, agriculture can draw on lessons from HIV care and treatment, energy and infrastructure, education, and the emergency sector. Finally, the discussion touched on the need to tread carefully when collecting data on this problem in agricultural communities. They agreed that a mix of methods is essential, as is a willingness to experiment with novel approaches. Jenn: We all want that one magic indicator to tell us gender-based violence is going up or down. Sadly, there isn’t a simple way to measure these things, and you have to be careful how you ask the questions. That’s why the qualitative and quantitative data are important; the numbers and the stories together are how we find out what is changing as a result of our work, and what the unintended consequences might be. Krista: And it’s a different kind of thinking and measurement, depending on how you’re approaching gender-based violence and who is in your ag system—you’re looking at changes over time, practices in the home, in the public sphere, and these things move at different rates. Sahar: This is another area where the AWE program is hoping to contribute. Part of what is needed is a willingness to try some new things. We don’t have the indicators we need right now, so we need to test. Proxy indicators can help us make some educated guesses, even if we can’t get the more sensitive questions answered directly. Collect more data to fully understand the risks, prevalence, and contributing factors for gender-based violence in agriculture. Agriculture, MEL, and gender/gender-based violence specialists should partner together to design, deliver, and measure safe and empowering agricultural programs. Engage a diversity of actors from the public and private sectors and at the community level in identifying solutions. On November 29, the conversation continued as part of a Twitter relay on gender-based violence in agriculture. How will you act on these ideas? What other ideas do you have to support survivors and prevent gender-based violence? Tell us in the comments below or by tweeting @EnCompass_World. EnCompass is grateful to Jenn Williamson, who is also the Gender and Agriculture Systems Advisor for AWE, and Krista Jacobs for their contributions to this post, and to all those who participated in our Twitter relay. Jones-Renaud, 2018, What Does a Survivor-Centered Approach to Workplace Harassment Look Like? International Women’s Day (IWD) is a time for the international development community to take stock of programming to ensure we think equal, build smart, innovate for change—the UN's IWD theme for 2019. This includes preventing and responding to gender-based violence. Violence in Honduras is alarmingly high, and the country has been included in the top five countries in the world for homicides since at least 1999. Youth bear much of the burden of this violence.